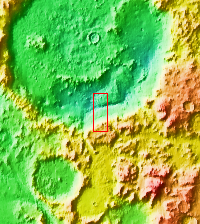 This VIS image shows a small portion of the floor of Galle Crater. This large crater is located on the eastern side of Argyre Planitia. The floor of Galle Crater contains many different features, including fluvial, glacial and aeolian derived products. The steep crater rim is toward the bottom of the image. The incised, flat laying materials at the top of the image are probably eroded layered deposits.